MADISON - Landowners, hunters and land managers looking to improve habitat for deer and other wildlife are encouraged to enroll in Wisconsin's Deer Management Assistance Program. DMAP provides informational resources and professional assistance regarding wildlife habitat management techniques for properties of any size to help participants improve habitat for wildlife. "If you're interested in seeing more deer on your property, DMAP is a great option," said Bob Nack, Wisconsin Department of Natural Resources DMAP coordinator. "The program provides individual property management plans and access to a community of other landowners working toward the same goal of improving wildlife habitat on their properties." Enrollment is always open, but properties of 160 acres or more are encouraged to enroll prior to March 1, 2019, to receive priority access to program benefits, including a site visit and walk-through in 2019 with a professional wildlife biologist and forester. DMAP participants receive access to statewide workshops on habitat and deer management, including professional presentations, property tours and hands-on demonstrations. In addition, they receive a unique opportunity participate in research projects and collect data on the deer they harvest and wildlife they observe. As one DMAP cooperator stated, "DMAP has been providing me with the resources and education that is helping me manage my property for quality wildlife habitat and a healthy forest." Be sure to check out an episode of the Wild Wisconsin: Off the Record podcast, titled "What can active management do for your deer hunt?" on YouTube, iTunes, Stitcher and PodBean to hear more from DNR staff and DMAP enrollees. For more information regarding DMAP and to apply, visit dnr.wi.gov and search keyword "DMAP." To receive DMAP email updates and other information, click on the email icon near the bottom of the page for "subscribe for updates for DNR topics." Follow the prompts and select the "Deer Management Assistance Program" option, found under Wildlife Management. MADISON - Wisconsin Department of Natural Resources staff will host a public hearing following implementation of an emergency rule regulating catfish harvest with a bow and arrow, crossbow or by hand. The emergency rule, which was implemented to protect wintering catfish from overharvest, sets size and bag limits, season dates and gear restrictions to regulate catfish harvest with a bow and arrow, crossbow or by hand. Prior to 2017 Act 297, these methods were not allowed because catfish are considered a game fish in Wisconsin and only rough fish could be taken with these methods. This rule does not impact hook and line regulations for catfish. The hearing will be held Tuesday, Jan. 29 at 2 p.m. in the State Natural Resources Building, 101 S. Webster St., Room 413, Madison. Members of the public may submit written comments to Meredith.Penthorn@wisconsin.gov - comments must be received on or before Jan. 29, 2019. For more information, visit dnr.wi.gov and search keywords "proposed emergency rules." MADISON - Applications for Wisconsin Waterfowl Stamp funds are due by March 8, 2019. Funds are available to non-profit conservation organizations and units of government focused on habitat conservation activities that will benefit waterfowl. Funding for successful applicants will be available during the Wisconsin Department of Natural Resources' 2020 and 2021 fiscal years, beginning July 1, 2019. "The Waterfowl Stamp, often called the duck stamp, is a critical source of revenue targeting habitat projects that are intended to directly benefit waterfowl breeding in and migrating through Wisconsin," said Jason Fleener, DNR wetland habitat specialist. "Waterfowl stamp funds have been leveraged strategically by DNR and cooperators for decades to earn grants, pulling in millions of additional conservation dollars into Wisconsin." On average, annual Waterfowl Stamp revenues exceed $500,000. 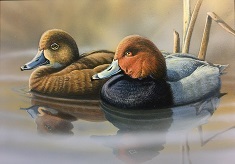 Stamp revenues are primarily generated by license sales from waterfowl hunters, but other outdoor enthusiasts can make contributions by purchasing collector stamps. Funds are distributed between DNR and non-DNR projects through a competitive application process. By state law, 33 percent of revenues are reserved for habitat projects in Canada. Cooperating organizations have implemented these habitat projects efficiently for several decades in the most productive waterfowl breeding areas that produce ducks that migrate through Wisconsin. An announcement for an open application period for Turkey and Pheasant Stamp project funding will be made later this winter. For eligibility information and criteria, application guidance, funding priorities, and further information, visit dnr.wi.gov and search keyword "wildlife stamps." MADISON - Cities, towns, villages, counties, tribal governments and nonprofit 501(c)(3) conservation organizations have until Feb. 15 to apply for financial assistance for habitat restoration and enhancement projects on public and private lands. Administered by the Wisconsin Department of Natural Resources, the Wisconsin Habitat Partnership Fund (WHPF) provides this assistance with the goal of increasing the amount and quality of land open for hunting, trapping and wildlife viewing. Grant recipients must allow public access for hunting, trapping and wildlife viewing on properties where habitat work occurs. Public access duration can last 10 years, 20 years or indefinitely based on the level of financial assistance received. Capital development projects (e.g., building construction, trails) are ineligible for funding and land acquisition is only eligible as a match. The DNR administers WHPF as a reimbursement program. This means the grant recipient must incur and pay all costs associated with the project before seeking reimbursement from DNR. Grant advances are not possible. Grantees can request partial reimbursements on a quarterly basis from the DNR during the life of the project. For more details, including staff contacts, search the DNR website for keyword "Grants" and click on the button for "Find Grants," and select Wisconsin Habitat Partnership Fund.